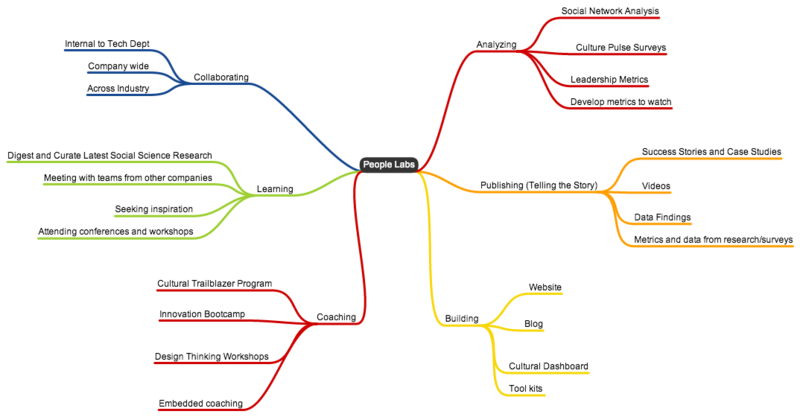 Interested in checking out our new People Lab? Apply here. This is a dedicated, full time team that will focus on learning, coaching, experimenting and designing tools, resources and workshops. Our primary role is to bring a data driven, human centered, innovative lens to our People, Culture and Leadership practices. This includes everything from supporting teams that are redesigning our Recognition program and Hiring/Onboarding Processes, to designing resources for teams and leaders, to collecting and visualizing data and metrics about our culture and people, and running Innovation Bootcamps, Design Thinking Workshops, and other coaching. The PiLab plays the unusual role of conducting applied research and development within People Operations, Google’s version of Human Resources. Doing R&D in HR isn’t a particularly common practice, but when your employees build virtual tours of the Amazon and tools to translate between 60+ languages, you need creative ways to think about productivity, performance, and employee development. The PiLab’s collection of industrial & organizational psychologists, decision scientists, and organizational sociologists have as their mission to conduct innovative research that transforms organizational practice within Google and beyond. Google’s PiLab did the analytical work on management that resulted in the Project Oxygen results. The Nordstrom Labs Hiring Handbook. I sent it to my team at Indeed Labs because it really resonated with our approach. Details on the upcoming Nordstrom Innovation Bootcamp. “Innovation Bootcamp is designed to be a fast paced, experiential introduction to tools, mindsets and techniques for conducting customer ethnography, brainstorming ideas, and rapidly prototyping ideas in order to test them.” The suggested reading list (below) is awesome. Moodometer. A pilot app for measuring the mood of employees. I look forward to seeing more great stuff on innovation from both labs at Nordstrom! p.s. If you’re interested in knowing what ultimately happened to that Nordstrom iPad app, Josh Seiden followed up with them and wrote about it. There’s also a great talk here by the one of the Nordstrom Innovation Labs members Jeremy Lightsmith (slides/PDF). This entry was posted in Uncategorized and tagged innovation, product management. Bookmark the permalink.